Beavers are the official mammal of New York State, and occur almost anywhere there is moving water and trees on the shoreline. They are also the largest rodent on the continent of North America. Adult beavers average a length of 3-3.5 feet and a weight of 30-60 pounds. They are most easily identified by their broad, flat tails that help them swim, fell trees, and signal danger, among other functions. The lifespan of most beavers is less than 10 years, but some individuals far surpass that, and can even reach age 20. The preferred foods of beavers are plant materials, including aquatic vegetation, and twigs and bark from trees. Their favorite species of trees to consume are poplar, aspen, birch, willow, and maple, and beavers make sure they stock up on these in the fall, so they'll be set through the winter. To make it through the colder months, a beaver family may require a one- to two-ton food cache. Aside from their flat, paddle-like tails, beavers are most well known for the large dams they build in running bodies of water. While most of these dams average about 100-200 feet in length and 5-7 feet in height, some have measured as long as 2,000 feet and as high as 10 feet from the bottom of the stream. To build these remarkable structures, beavers use their sharp front teeth to fell trees, which they drag into the water. They anchor the wood with mud and rocks, and pack mud, leaves, and other debris in between logs to hold back the water. Beavers build dams to stop the water from running, so a pocket of deep water is created. They choose to build their lodges in these areas of deep water, so they can dive down and be safe from predators. Beaver lodges are typically 12-14 feet wide at the base, with 5 to 6 feet protruding above the water. Like dams, lodges are built from logs, sticks, rocks, and mud, and typically feature two underwater tunnel entrances. Beavers also build separate feeding and bedding areas. In the winter, lodges may hold the adult male and female, their young from the most recent breeding season and the one before that, and occasionally related non-breeding adults. As many as 12 individuals could lodge together. Beavers were abundant before European settlement, and could be found all over New York State, with the exception of Long Island. Unfortunately, the popular New World beaver pelt trade and deforestation resulted in only a few beavers being left in the Adirondacks by 1840. 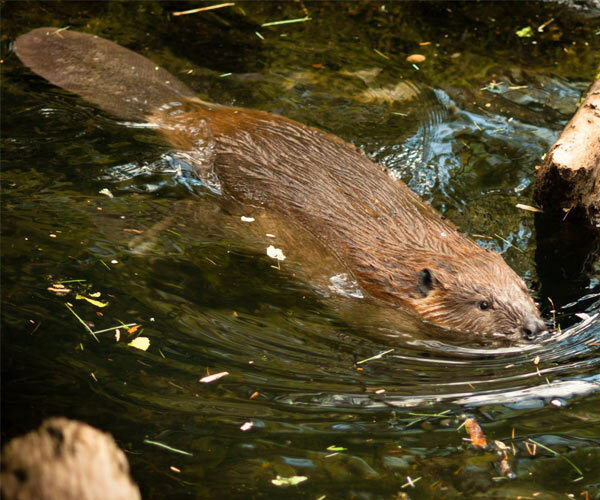 Between 1901 and 1907, 34 adult beavers were released into the region by private landowners and legislators who wanted to help the species' numbers increase. By 1924, the population had grown so significantly that a regulated trapping season was instituted to control nuisance and damage. The Department of Environmental Conservation estimates that the current beaver population in the Adirondacks is between 50,000-70,000. Over time, it has been found that the regulated trapping has been the most effective means of reducing the negative impact of beavers on other species. While they are an important part of the ecosystem, beavers can unfortunately flood property, cut down rare trees, and can lead to water temperature increases that make bodies of water uninhabitable for other species, like trout.